The wheels are your Camry are the unsung hero of your car. Without them, it would be impossible to get your Camry to move forward. We often don't think about the wheels, unless one becomes damaged. Although they are sturdy, wheels often get damaged during accidents or if they're curbed too hard. If this should happen, the only way to restore function is by replacing the OEM wheels with new Camry wheels. 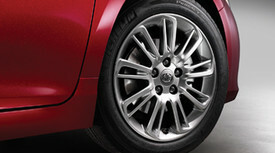 OEM Camry wheels are made to the exact specifications as your factory wheels. They are made to be an exact fitment and an exact match. If you buy aftermarket wheels, they often don't match the rest of the set. Usually, the difference is quite noticeable. Don't settle for cheap knock-off Camry parts or accessories. Buy yours from Olathe Parts Center to get low prices on OEM parts. We also offer fast shipping and easy returns for a simplified shopping experience. Get your OEM Camry wheels now.